Today I have a card to share using the beautiful Winter's Eve Collection from Heartfelt Creations to make a gorgeous summer window box. Other Products Used: Pearl White Metallic Cardstock, White Linen Metallic Cardstock, Lavender Metallic Cardstock, Gold Linen Metallic Cardstock, Hot Glue Gun, Memento London Fog Ink Pad, Crafters Companion Embossing Folder, Dimensional Tape, Sponge, Sparkle Sheer Shimmer Spritz. Instructions: Create a 5” x 7” card base from white linen metallic cardstock. Cut a green mat 4 7/8” x 6 7/8” from the Wildwood Cottage Paper Collection and ink the edges with Bamboo Leaves. 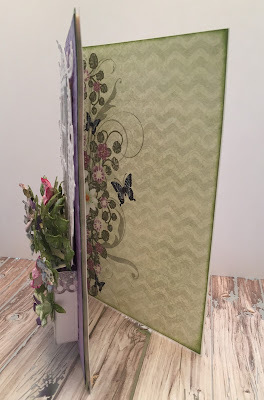 Cut a lavender mat 4 3/4” x 6 3/4”, emboss with embossing folder and ink the edges with London Fog. 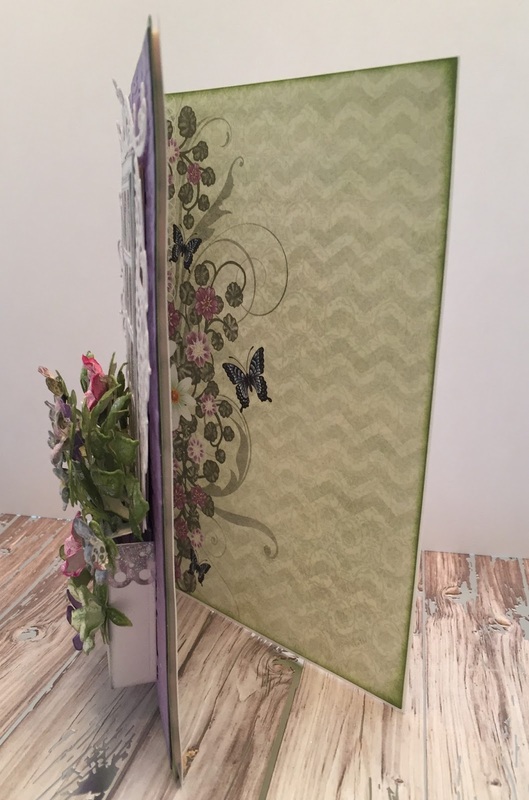 Adhere lavender mat to green mat with Dries Clear Adhesive and adhere to card base with dimensional tape. Cut another piece of designer paper 4 7/8” x 6 7/8”, ink the edges and adhere to the inside of the card. Stamp the window on pearl white metallic cardstock and cut out with matching die. Adhere clear cardstock to the back of the window frame. Cut the decorative Festive Holiday Die, trim to create lace curtain and adhere to clear cardstock. 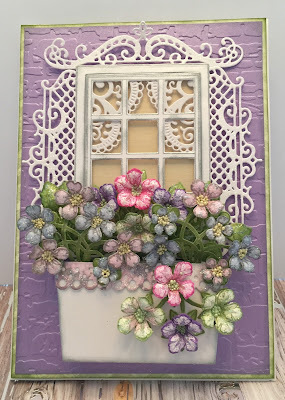 Cut out all the pieces from the Window Box Elements Die set, sponge the decorative pieces with Dries Clear Adhesive, sprinkle with glitter and adhere to the window. Cut the gold linen cardstock 2 3/4” x 3 3/4”, adhere to the back of the window with Darice Adhesive Foam Strips and adhere to card base. Assemble the window box. Cut the trim from the Wildwood Cottage Paper Collection, add glitter and adhere to window box. Stamp Wildwood Florals on designer paper with London Fog Ink and cut out with matching die. Stamp the Classic Petunias in assorted colors on White Cardstock, color using Stack and Store Daubers and cut out with matching dies. Shape all of the flowers with Deluxe Flower Shaping Kit, add prills to the centers and add glitter. Stamp the window box fillers with Bamboo Leaves, cut out with matching dies, color, shape and spray with Sparkle Sheer Shimmer Spritz. Adhere Wildwood Florals and Classic Petunias to fillers and adhere to window box with hot glue gun. Gorgeous card - I love the flower box! I love all your cards, but this is one of my favorites! Thank you my biased friend!